7 phases of cell division and growth in a fun online biology learning game. 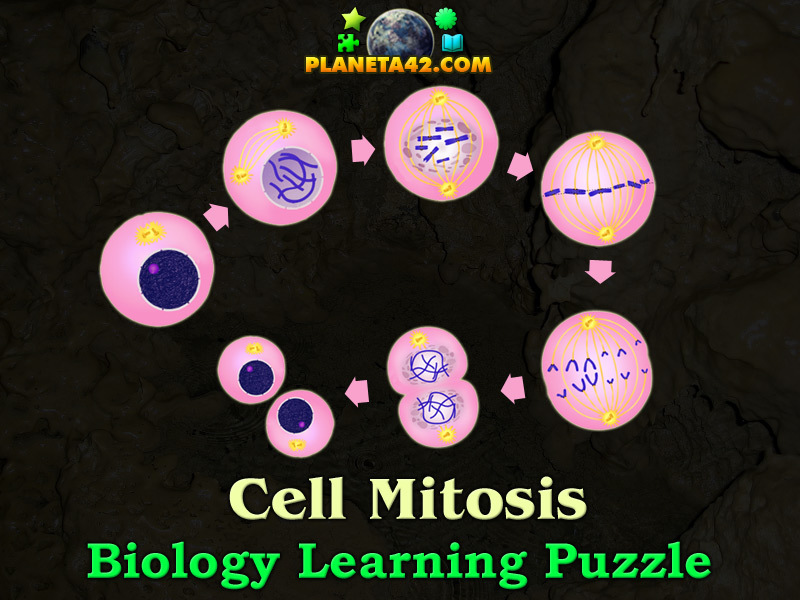 "Cell Mitosis Online Puzzle" is a free online knowledge level game, about the 7 phases of cell division and growth, made interactive to help in classes and for fun studies. Drag and drop the pictures in the correct phase of mitosis. A small puzzle game for desktop computers, laptops and tablets, which may be played in the web browser. The Biology Knowledge Board include 7 small biology topic pictures to play with. The game is part of the Interactive Biological Laboratory educational tools. How is cell division called? Pictures of cell mitosis stages will appear in a random position on the screen. Drag and drop them in the correct phase socket, marked with the phase name. Pictures may sometimes overlap, so drag them on emty space to reveal overlaped picture. The tries counter is used for evaluation. 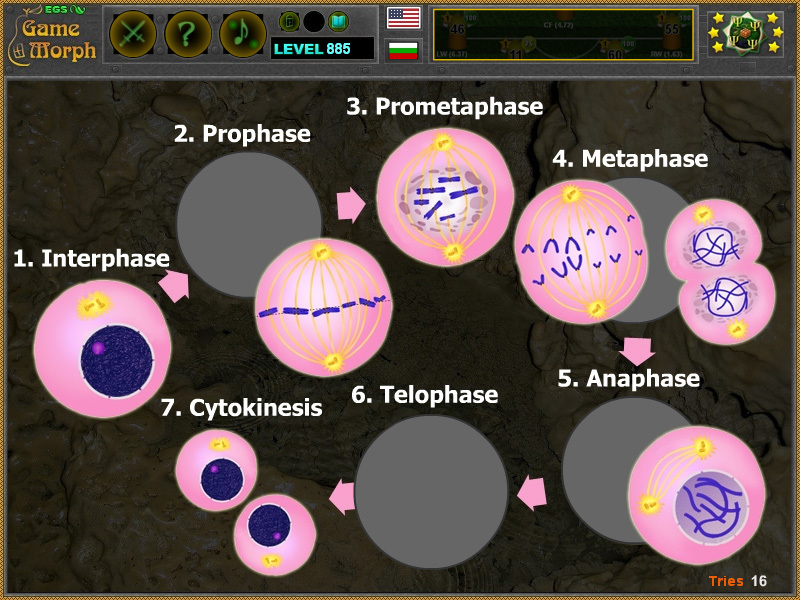 Know the 7 phases of mitosis and get +1 Knowledge Level on Planeta 42 website. Class subject: Cell mitosis phases. 1. Interphase G2 - The period between mitotic divisions - that is, G1, S and G2 - is known as interphase. 2. Prophase - Prophase occupies over half of mitosis. The nuclear membrane breaks down to form a number of small vesicles and the nucleolus disintegrates. A structure known as the centrosome duplicates itself to form two daughter centrosomes that migrate to opposite ends of the cell. 3. Prometaphase - The chromosomes, led by their centromeres, migrate to the equatorial plane in the midline of cell - at right-angles to the axis formed by the centrosomes. This region of the mitotic spindle is known as the metaphase plate. 4. Metaphase - The chromosomes align themselves along the metaphase plate of the spindle apparatus. 5. Anaphase - The shortest stage of mitosis. The centromeres divide, and the sister chromatids of each chromosome are pulled apart and move to the opposite ends of the cell. The separated sister chromatids are now referred to as daughter chromosomes. 6. Telophase - The final stage of mitosis, and a reversal of many of the processes observed during prophase. The nuclear membrane reforms around the chromosomes grouped at either pole of the cell, the chromosomes uncoil and become diffuse, and the spindle fibres disappear. Labels: Microbiology , Puzzle Games , Flash Games , Biology Games , Education Games , Free Online Games .